Welcome to 2009 and the latest make a big difference newsletter. I hope that the New Year brings much health, happiness and prosperity to everyone. As you know, last December we re-launched the website making improvements to its look, feel and usability. Since then we have made some further changes to the home page integrating links to various sections of the website for ease of use including a PayPal link, for a simple and convenient way to donate online and a quick link to download and print a donation form. For those who are familiar with Ebay, you may have heard about Ebay for Charity. This is a simple and effective way to turn your old clutter into cash and donate a percentage of the final sale price to Young Heroes. For more information please see my featured article ‘Ebay for Charity’. Another notable addition to the web is the link to Everyclick.com. Everyclick a new category of search engine that allows you to search the internet just as efficiently as any other; the big difference is that every click you make will benefit Young Heroes, at no extra cost to you. Please show us your support and visit www.everyclick.com to find out more information. Lastly I would like thank all those who continue to support us and the feedback we have received it is much appreciated. 22 year old Robert Mann has been volunteering for Impact for just under a year as an administrator. Robert, the youngest of 3 children, was born in Northamptonshire in January 1986. He grew up living with his mum, stepdad and older brother and sister. Unfortunately he never knew his biological father, who left Roberts’ mum when she was heavily pregnant with Robert. Relations with his stepdad were also somewhat strained and the pair clashed leading to many a fight. Growing up, Robert says he had a good childhood. He was popular at school, had many friends and enjoyed sports related lessons, particularly cross country and football. His struggle began around the age of 14, when like many young adolescents, he began to rebel particularly against his teachers, who he saw as authority figures “bossing him around”. He began to skip classes, which soon led to missing whole days at school. On the days he did attend he says he was arrogant to the teachers and generally misbehaved in classes. All this subsequently led to Robert been expelled from numerous schools during his schooling years. During the next few months after leaving school, his mum moved away and Robert rented a room in the house of a family friend. He went to college to study Motor Vehicle Maintenance; although he disliked college he persevered and completed the year long course. Towards the end of 1996, he received the devastating news that his mum had Stomach Cancer. Within weeks he had moved up to Keighley to help care for his mum, but struggled adapting to life with her, triggering a stem of arguments which left Robert feeling unable to live there. After a year he briefly moved back to Northamptonshire but felt that there was nothing there for him anymore so returned back to Keighley to rebuild his relationship with his mum. Soon after the arguments started again and with tensions flying, Robert’s mum asked him to leave. Facing homelessness, he moved to Bradford where he was placed in a Salvation Army Hostel, where the then 19 year old was housed amongst homeless men, many battling alcohol and drug addiction. Robert describes this experience as “the worst place ever”. After a month, Robert was offered tenancy by a local housing association. Whilst he was happy and enjoyed living there, he made a series of mistakes which led to his eviction. One such mistake saw Robert keeping ‘look out’ whilst 2 friends broke into a property. All 3 were caught, arrested and bailed. Robert was asked to leave his flat and received 150 hours community service, a 2 year licence and 6 month suspended sentence. The thought of prison terrified him so he didn’t miss a single hour’s community service which was digging at a local allotment. He says. “I even spent my 21st birthday digging, it was back breaking but I just got on with it. I was so scared at the thought of prison”. 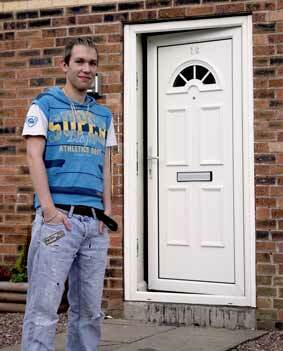 In the meantime Robert returned to his mums where he stayed until he had completed his community service. Nevertheless a string of explosive arguments made Robert feel unable to live their long-term. Robert found out about Impact through a friend who was volunteering for the charity. He moved into an Impact flat, made new friends and began volunteering as a cleaner 2 hours a day. In May 2008 he began a voluntary work placement at Impact as an Administrator at the Park Road office via the government’s new deal for employment. He is still learning a great deal and is enjoying all of the challenges that the placement brings. When asked what the best things about Impact were, he said “Impact has really helped me manage my money and bills”, he goes onto say “Before Impact I used to spend all of my money at once, not budgeting for bills or anything”. Robert also says that through working for Impact he has learnt lots of new things and systems which he would not have had chance before. When asked what advice he would give to other young people in the same situation he explains “Living in Impact is a lot more realistic than some other housing associations. You get a great deal advice and support and by the time you move on, you are prepared for independent living. Impact is an opportunity, take it”. Although Robert is doing well, he now faces a new battle, Hypertrophic Cardiomyopathy; a potentially fatal genetic heart disease which causes thickening of the heart muscles. Robert’s diagnosis, back in December 2008, has meant a dramatic change in his eating habits and he is in the process of joining a gym, quoting “the doctor basically told me, get fit and healthy or die so its really important I eat right, take vitamins and exercise”. Special thanks to Robert for the use of his story. It seems wherever you go people are talking about Facebook. With over 140 million active users worldwide its debut back in September 2006, Facebook truly has taken the world by storm. make a big difference is now engaging with people on the internet through Facebook. If you haven’t yet signed up to Facebook then here is your chance to find out what its all about and also become a supporter of the charity. Visit www.facebook.com and create a profile and the world of social networking has begun. To find us just search Make a Big Difference or click this link. To join the group click on the Join Group, it’s straightforward as no confirmation is required and as a supporter you will be able to keep up to date with events, service developments, forums, talk to other young people with cancer, and much much more. The main thing that you can all do though for us is to encourage as many of your Facebook friends to join this group. It would be fantastic to get our first thousand members by Christmas 09. So please invite all of your friends on your list to join? At 16, Dan Hewitt was at a time in his life when he should have been going out with friends, playing sports, thinking of future careers, college, instead he lay hooked up to a machine undergoing intensive Chemotherapy for Acute Lymphatic Leukaemia. Dan, now 20, is the first Young Hero to move into Impact accommodation. Dan had just turned 16 years old when he decided he wanted to follow the family trade and become a Hairdresser in his home town of Barnsley. He began studying at college and enjoyed the prospect of his future career however just 2 weeks into the course, his whole life changed forever. Dan, who was living with his grandad at the time; began feeling unwell over the course of a couple of days, It began with nausea, vomiting and profuse sweating, often waking in the morning to sweat soaked bed linen. One particular night, he lay curled up on his bed seething in pain. His grandad began to panic and called Dan’s mum to go to the house immediately. He was taken to an emergency doctor where he nearly passed out and according to his mum ‘his face turned grey’. Dan recalls how the next few days became a blur, clouded by the morphine, “its like I blanked out, I just can’t remember a thing” he says. He was immediately taken to Barnsley Hospital but later transferred to Sheffield where he would stay. Over the next few days, Dan’s lung collapsed and he was moved to a high dependency ward where he underwent treatment for 6 weeks in the form of a ventilation helmet enclosing his entire head. Dan says “I had to wear a special helmet which was horrible. It was really claustrophobic and sometimes I had the treatment up to 11 times a day, it was a horrible feeling”. Once Dan had recovered from the collapsed lung, the doctors began to run a series of tests starting with a bone marrow test. Despite the local anaesthetic, the procedure was excruciatingly painful. On the 19th September 2005, Dan’s parents were told their son had Acute Lymphatic Leukaemia. Heart wrenchingly they had to break the news to Dan. “I just broke down in tears, I was so scared and in shock. My head was just in bits. I honestly didn’t think it was going to be that serious”. Within days Dan started Intensive Chemotherapy. The treatments took their toll with his weight plummeting, constantly feeling nauseous, severe vomiting, difficulty eating and he particularly struggled to come to terms with losing his hair. He was also left with very little strength and energy. Chemotherapy continued for a further 3 years and affected his muscles, destroying the soft muscle tissue in his right leg. He had physiotherapy and had to learn to walk again with sticks. Further blows were to hit Dan along his journey including a bleed on the brain, contracting C – Diff (Clostridium Difficile) a hospital bug more prevalent than the notorious superbug MRSA and numerous chest infections. Dan’s family became his rock and their undoubted support helped pull him though the hard times which he is most grateful for, but heartbreakingly at a time when he most needed his friends, many struggled to come to terms with Dan’s illness and simply didn’t bother him anymore; others selfishly took advantage of his physical and emotional state, encouraging him to take drugs and steal from him. Though his Health Worker Dan was offered tenancy from a housing association in a bungalow located just 5 minutes from his parent’s house, he says “the bungalow was lovely and really immaculately kept, I had to keep it that way because of risk of infections and I just found it easier having my own space”. Unfortunately his bungalow was broken into shortly after moving in and pretty much everything was taken including his computer which had been a great social tool for Dan whilst undergoing his treatments. With all the events that had taken place over the last 3 years including the break in, Dan finally crumbled and began suffering with depression. The realisation hit him hard. Dan’s social worker mentioned to him about Young Heroes and the possibility of a holiday in Lanzarote. He was thrilled and the thought gave him a much needed boost. In May 2008 the holiday became reality for Dan and his mum, along with his Aunty, Grandma and Grandad who flew out to join them. Dan recalls “The holiday was fantastic; we had such a laugh and the most beautiful meals in the restaurants. It felt brilliant to leave everything behind and I started to feel so much better”. He goes onto say “My close family came to join us as they wanted to see me smile again after such a tough few years, they enjoyed every minute of it”. Bev and Rob Law who supported Dan whilst in Lanzarote continued to visit him and his family on a regular basis and were the first to tell him about Impact Accommodation and asked if he would be interested. It would be a chance to live independently but with the reassuring support from Impact staff. In October 2008 Dan moved into his new flat in Bradford. “I absolutely love the flat and get loads of support here”, he says. As his strength and confidence continue to build everyday, Dan plans for his future, hoping that one day he can train to become a Social Worker, “My illness has changed the way I think and ideally I want to help people as a job, people who can’t perhaps help themselves”. Thanks to Dan for giving Impact permission to use his story and photo. 24 year old Craig is a quiet, endearing young man who has volunteered for Impact for just over 2 years as a Maintenance Worker. His story tells of the sad truth facing many young people nowadays, lured into a life of crime, fights and gangs, to name but a few. Craig, the youngest of 3 children, grew up on Holme Wood, a large council estate in Bradford. He had a good stable upbringing living with his parents, brothers and his sister and enjoyed computers, playing football with his friends and school. It wasn’t until he started secondary school that cracks started to appear in his life. Struggling in classes; boredom and pressure from friends all led to Craig regularly skipping school and eventually he was excluded in grade 10. Once school was no longer an issue he fell prey to the ills of the streets, mixing with gangs and getting involved in fights. At the impressionable age of 14, Craig was introduced to car crime through a friend which ultimately led to stealing cars to order. He was arrested numerous times but managed to dodge a youth offenders institute and prison. He says at such a young age he wasn’t fazed by the courts saying “I was young and I didn’t really care because I was just going to a youth court. It wasn’t until I was older and the thought that I may go to real prison that I began to turn my life around”. Craig bears the physical scares from one of his fights, a 3 inch scare on his right cheek. He says “I was 17 and out in Holme Wood, the lad I was fighting pulled a knife on me and caught my cheek”. Once the fight had ended, Craig started to make his way home when he was spotted by the police. He was taken to hospital where he spent the night and received a staggering 52 stitches. In 2003, Craig moved out of Holme Wood, a decision which he says saved his life “I stopped crime as soon as I moved away from Holme Wood. I’m so glad I did because I would not be here today if I hadn’t”. He moved to the East Bowling area of Bradford where he met his now fiancée Mel. The pair have been together for 5 years now and have 2 beautiful children Scott, 2 and Kacey, 1. Impact Young Heroes has teamed up with Ebay for Charity and their charity partner Missionfish to enable supporters to buy and sell items on eBay whilst supporting Young Heroes. Buyers can shop safe in the knowledge that their money will go to a good cause, while sellers can choose what percentage of their final sale prices they wish to Young Heroes. Shop with Young Heroes whether you’re after an everyday item or something out of the ordinary, take a look through what’s on offer at Young Heroes. The money you spend will go direct to the charity, 100% of it! Simply go to; www.ebay.co.uk, advanced search, by seller, user ID: impactcharity or click here to see the goods we’re selling online at the moment. If you have an item to sell on eBay, whether your an individual or business, and would like to donate a percentage of the final sale price to Young Heroes, simply create an eBay seller account if you do not already have one and register your items. in addition when you list an item for charity; you’ll get a fee credit equal to the percentage you donate. So if you donate 50% of your selling price to a charity, eBay will waive 50% of your fees. Not enough? You also benefit from your listing really standing out. Your listing will be marked with the special blue and yellow ribbon so others know you are supporting a charity. MissionFish, the charity who manages the eBay donation process, will then collect your donation when the auction ends and pass the money on to Young Heroes and please remember to claim gift aid on your donation. If you would like to find out more about eBay for Charity, please visit the eBay for Charity website and the MissionFish website. So why not buy or sell an item for Young Heroes today. Posted in Newsletters and tagged 100 club, aggressive, an award winning, annual, anxiety, bahadur, bev law, birmingham, cancer, care advice, centre for oncology, charities, charity, charity's, cheshire, children, childrens hospital, christie hospital, clatterbridge, clic sargent, clicsargent, depression, developed cancer, diagnosed, disadvantaged, donations, events, facts, foundation, growth, health, homeless, hospital, housing, immune system, impact, Impact Young Heroes, isolation, kids, leeds, life threatening condition, living, macmillan, Make a Big Difference, making a big difference, Manchester, misdiagnosed, newcastle, nissar, people, raise public awareness, report, respite, risk, royal victoria infirmary, Sheffield, spurts, st james, support, supported, teenagers, terminal illness, traumatic, treatments, vulnerable, western park, young, young heroes.